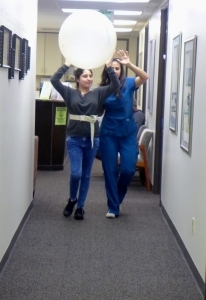 Our neurologic physical therapist specializes in the evaluation and treatment of movement problems due to disease or injury of the nervous system. Because the musculoskeletal system is usually affected with neurological problems, our neurorehabilitation physical therapist also is experienced in treatment of orthopedic conditions. She uses a combination of functional exercise, strengthening, and proprioceptive neuromuscular techniques that facilitate associated reactions to regain motor control in the affected areas. Her goal is a faster return to functional independence and to an active and healthy lifestyle post-neurological injury. Through evidence-based neuromuscular training, balance training, strength training, and gait training, our neurorehabilitation specialist works on improving your independence and accelerating your recovery, back to the hobbies and activities you enjoy.